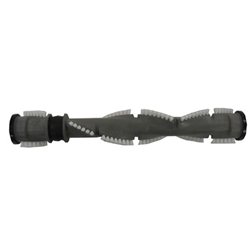 Brush Roll Assembly for PowerForce® Helix™ Turbo | 203-8045 This part works with the following products: PowerForce® Helix Turbo Bagless Vacuum | 68C71 Similar Models: 2140, 68C7, 68C7C, 68C7R, 68C7S, 68C7U, 68C7V, 68C7W, 68C7X, 68C7Y, 68C7Z The Brush Assembly includes the brush roll and brush end caps. The end caps are attached to the brush roll and cannot be removed, they help hold the brush in place within the machine. The bristles on the brush roll reach into carpet to help remove dirt and debris. Over time, the bristles on your rotating floor brush may wear. You should check your vacuum cleaner's rotating floor brush and drive belt regularly for wear or damage. If you notice your machine is not operating at its best performance, check to see if the brush assembly needs replacement.